Alexander Knox, a great actor all but forgotten by history, gave inarguably his two greatest performances in 1944. In a way it’s a shame — he was nominated for Best Actor as the title character of one of 1944’s heavyweight contenders, Wilson. Had that picture, which earned a robust five Academy Award nominations come out in any other year, or vice-versa, he may have also been nominated for his chilling performance in None Shall Escape. The real shame is that neither film is widely available. Wilson was released to videocassette in a limited fashion many years ago, while None Shall Escape, despite its extraordinary relevance, has never seen the light of day, with the exception of a rare TCM airing. The marketing approach of Escape’s poster suggests that Columbia was unsure what to do with it either. Not surprising given the film’s concept, as well as its lack of a major star. Considering the ensemble cast, Knox could have garnered a Supporting Actor nomination — despite clearly being the film’s star. None Shall Escape is a difficult film to write about. It’s one of those pictures about which there is simply too much to say; there are too many angles of approach, too many lenses through which to view it. If nothing else, it’s a film that simply must have an engaging production story. Director André De Toth was obviously close to the project — born in Hungary, De Toth came up through the ranks of the central European film industry, and even filmed the German invasion of Poland in 1939 as a news production cameraman. He was a Hollywood emigré when this was filmed, but the results have a certain veneer that belies both De Toth’s youth and the film’s meager budget. Escape received a nomination in the Original Story category for writers Alfred Neumann and Joe Than, though James Steffen over at TCM relates that De Toth brought in future Hollywood Ten member Lester Cole to doctor the script. The film’s premise is a little complicated. Released while the outcome of the war was still in doubt, and told through a series of flashbacks, it is nevertheless set in the future — and a very prescient one: the Allies have prevailed and form tribunals to hold the Nazis accountable. The narrative revolves around the aptly named Wilhelm Grimm (Knox), a German who teaches school in a small village in Poland. As the film opens, Grimm is being put on trial for his actions during the war; a parade of eyewitnesses are brought to testify against him, including his brother and ex-fiancé; the story is told through their recollections. When the First World War comes, Grimm enlists in the German army but returns from the fighting grievously injured, having lost his right leg along with the better part of his soul. Embittered, he begins to see the world in a different light, and in time becomes infatuated with Nazism. Shunned by his fiancé, he commits a crime that results in the death of one of his pupils and the loss of his left eye! A harried Grimm begs the help of the local clergy, including the village rabbi, in order to escape Poland. He heads for Munich, where he moves in with his bookish older brother and officially joins the Nazis. He quickly rises in the party, and what little humanity he had left is given over to Hitler. When his brother chooses to flee Germany for Austria, Wilhelm has him arrested and sent to a concentration camp. To add insult to injury, Wilhelm takes over the education of his nephew, and tries to create a Nazi officer in his own image. In the wake of the Blitzkreig, Grimm returns to his Polish village — this time as the SS commander of the forces garrisoning his old village — with predictable results. None Shall Escape is mind-boggling in its accuracy. The film is so on the money that it’s actually hard to believe it wasn’t made ten years after the end of the fighting. Although it has many uncomfortable scenes, most of them are the result of things said by Grimm. One however, is quite simply astonishing: as the Nazis round up jews to be taken to forced-labor camps, the town rabbi (a man who previously helped Grimm flee the country) asks to address his congregation, being shoved onto cattle cars. Grimm consents, in hopes of quieting the scene, but is shocked when the rabbi tells his people that they are being taken to their deaths, and encourages them to stand instead, and fight. What comes next is surprising, but not in the way you might expect. It isn’t shocking that Grimm orders his troops to machine gun the jews — it’s shocking how graphic the scenes is — De Toth even shows bullets slamming into the bodies of already slumping children. At the conclusion of the scene, the rabbi staggers to confront Grimm, who at first appears to rush over to embrace the man, but instead casually draws his pistol and shoots the man in the chest. I could write many, many more words about None Shall Escape, but I don’t want to give away anymore about the story than I already have; and I hold no illusions that I could maintain interest if I did so (but I’ll reserve the right to revisit this one on the occasion of another viewing). If nothing else it’s an absolutely superior B film with a stellar performance from Alexander Knox. It also deserves a wide DVD release, if only for academic purposes. I’ll keep hoping for that book. Availability: Has aired on TCM, bootlegs. I just saw this film over the weekend. You covered just about everything I was going to in my review! I'm not complaining, though. This is an incredible film. Henry Travers impressed me as the village priest. Also, I forgot that "Wilson" came out that same year, also with Knox. He had a great year. Fire away Tom, I'd love to read another's thoughts about this film! I was surprised that this film was made before the end of the war. The atrocities of the nazis were there in full as if gathered from the memoirs of survivors many years later. I imagine that some felt the evilness to be overplayed in 1944, as I have been led to believe that the public were shocked at what was found in the liberated death camps at the end of the war. 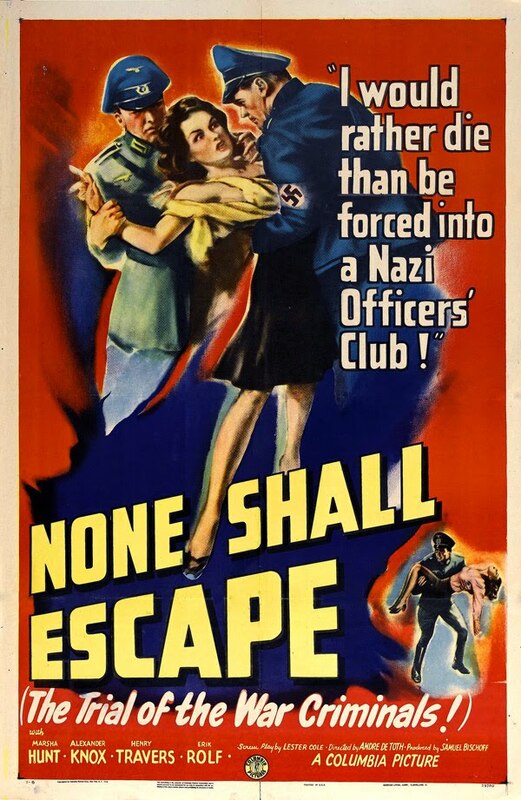 Being a kid in the forties I saw many "anti-nazi" films: JOURNEY FOR MARGARET, MR.V., RED STAR, FIVE GRAVES TO CAIRO, FALLEN SPARROW,etc., but the most wrenching scenes were from John Ford's Documentary on the rise of the Nazi ethos which I projected as film squad at Seward Park H.S. Some of the viewers were Shoah Kids!